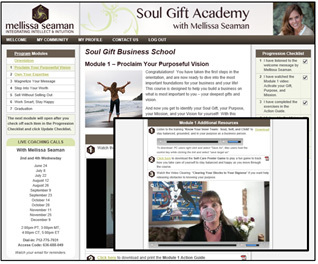 Virtual Academy Builder is our e-learning division that transforms your book, program content or coaching process into a state-of-the-art, automated e-learning experience that clients love and that can be leveraged for years to come. We walk you step-by-step through the process of getting us what we need to populate your online course enabling you to focus on your proven process rather than technology. Complements your business brand including color scheme, banner, logo treatment and images creating a cohesive look and feel with your main website. Automated registration of clients who purchase your course so they can create their unique course login information and you have no admin costs or hassles. 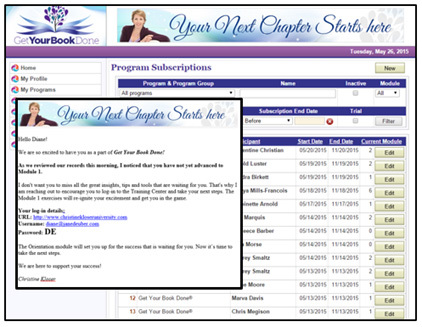 A personalized welcome message is sent immediately upon registration to inspire clients into immediate action as they complete your expertly designed 4-step Orientation. 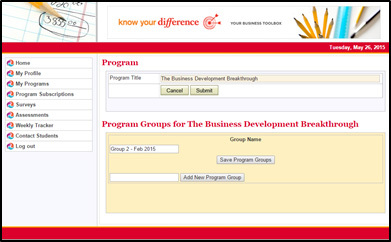 Clients can update their contact information, change their password and activate a personal profile allowing them to connect with and collaborate with other participants within your course community. You have the option of protecting your intellectual property by blocking the downloading of audio and video files. Choose from our flexible delivery modes to create the learning experience you desire. Live Mode – used typically during a first time launch whereby the modules are opened in correspondence with your live community calls. 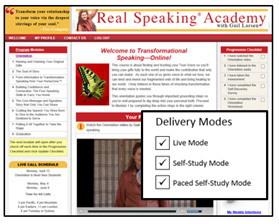 Self-Study Mode – this allows clients to progress through the modules at their own pace. 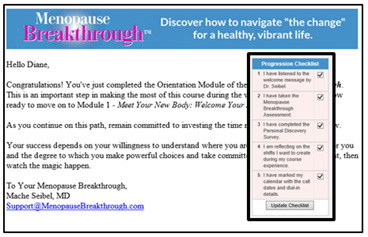 Paced Self-Study Mode – this allows you to determine the pace at which your clients access your content by specifying when modules are opened. 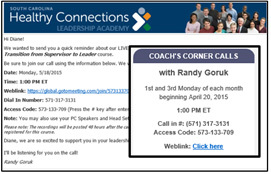 We handle the time consuming task of keeping clients informed about live calls and webinars. 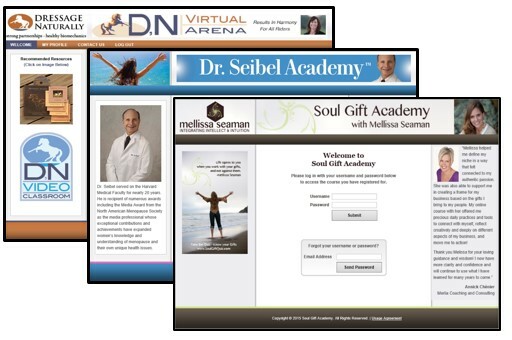 Using our expertly crafted email templates, we’ll keep clients informed, engaged and inspired to participate live. 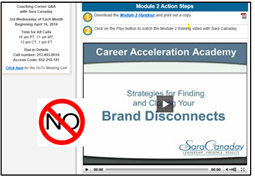 Your Virtual Academy Builder course features automated module progression checklists and acknowledgement tools, including a built in auto-responder system for active student communication. Bonus features include our “nudge” system that reminds students who stay in a particular module for too long to move forward to what’s next. 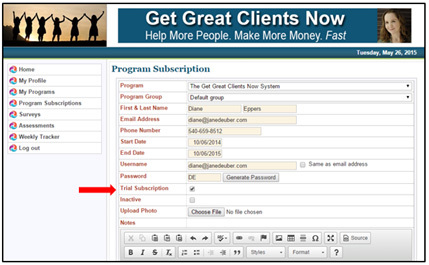 Monitor client progress, add and edit client profiles and notes, and review client uploads and homework and email your clients. No other course delivery system features this robust management system allowing you to know at a glance where each student is in your course. How your students start your course will determine how, and even if, they finish your course. You’ll create your course Orientation following our proven 3-step Orientation process, including an Assessment and Client Discovery Survey. Meet the needs of a variety of learning styles by delivering your content through printable documents, audios and videos. Our automated progress tracking system allows you to spot high performers, identify those that may need additional support and automatically nudge those who are falling behind. This not only inspires completion of your program it also creates a sense of feeling seen, supported and inspired. 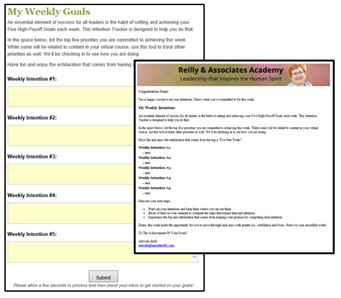 Provides a goal-tracking system that enables students to set weekly goals in relation to the course content and then tracks the completion of each goal on a weekly basis. Each student’s goal achievement is tracked and depicted on a grid for both the student and instructor’s review. This reinforces the mindset of setting and achieving small, doable goals. 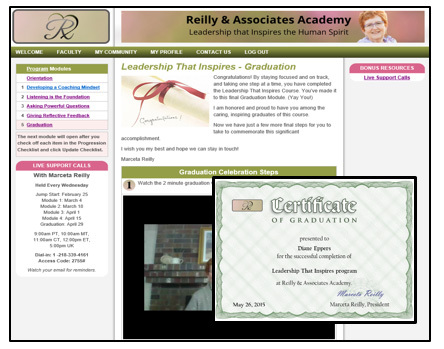 An audio or video message that congratulates them on the completion of the course. 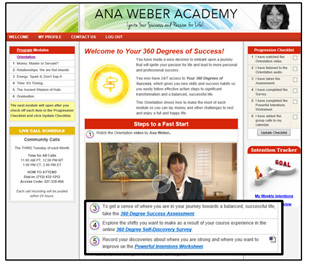 An invitation to re-take the course assessment to track their progress. 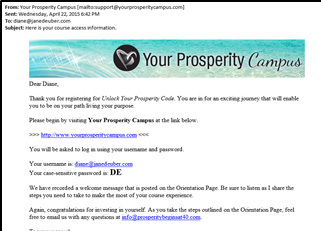 A “next steps” offer that provides you with additional revenues and a loyal client for life. Allows you to segment groups of students into separate clusters to correspond with specific facilitators, start dates, or student source (i.e. corporate group). You can run more than one group through your course at one time enabling you to double or triple your revenue without doubling or tripling your time. 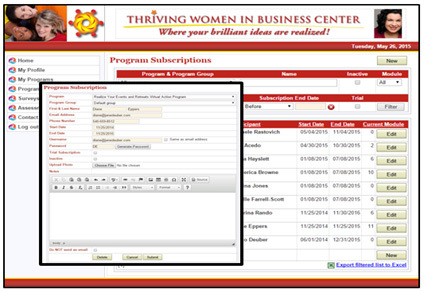 This feature allows trainers to provide Orientation and Module 1 access to individuals and to offer them an automated “upsell” email inviting them to continue in the course by purchasing the program. 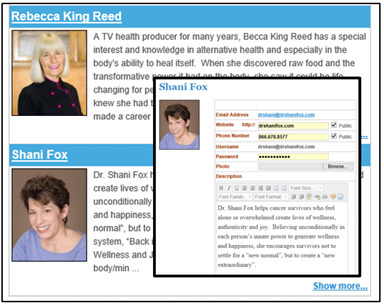 By using the feature, you give them a sample of your work which can leave them wanting more. 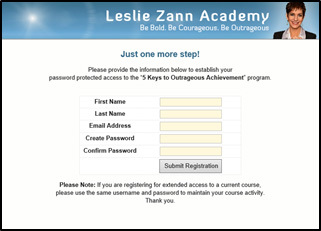 Begin leveraging your asset with automated upsells from the moment your first student logs in to your course. From the welcome page cross sell, to module upsell strategies, to your Graduation “next steps” and “Extended Pass” offers, your students will experience your range of services throughout your course creating additional revenue streams.